Kiwa hirsuta is a crustacean discovered in 2005 in the South Pacific Ocean. The length of the crab is 15 cm. It is also called as “yeti lobster”. The animal has strongly reduced eyes that lack pigment and is thought to be blind. The “hairy” pincers contain filamentous bacteria which the creature may use to detoxify poisonous minerals from the water emitted by the hydrothermal vents where it lives. The Yeti is known to have heavy layers of white fur all over its body. It is specifically unique for its quantity of silky blond setae covering its legs and claws. Setae would refer to the fur-like hair covering it. 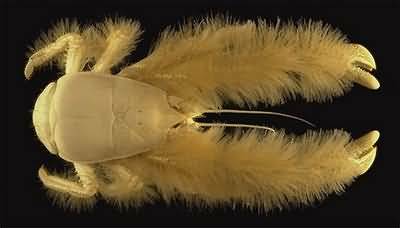 Yeti Crabs are found Pacific-Antarctic Ridge in the depths of 2,200 meters. Bacteria is a mainly diet of yeti crab.